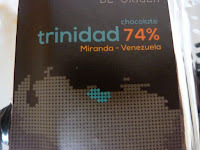 Today was Day #9 of Chocolate and Venezuela Theme Week. 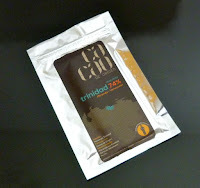 Today's Trinidad 74% cacao bar from Cacao de Origen (Hacienda La Trinidad, Caracas, Venezuela), was crafted with cacao beans from Hacienda Trinidad, grown in the northern coastal mountains of Miranda, Venezuela. 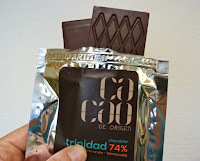 The thin bar (one of two in a sealed silver package), enabled easy access to flavors when tasting. 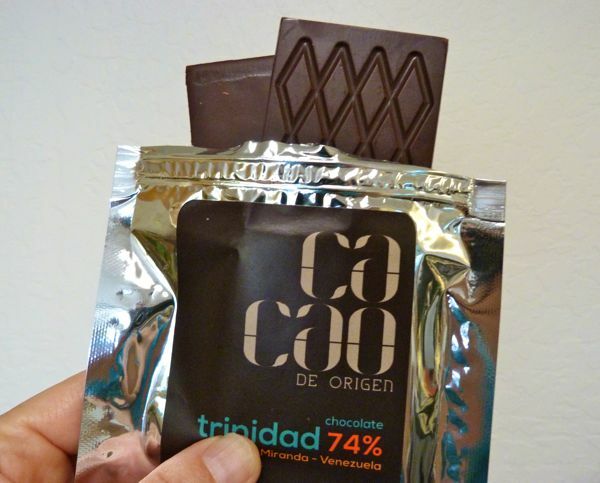 This chocolate was smooth and full of flavor -- very faint green vegetation and floral notes, tart citrus acidity, and smooth earth flavor notes, and a smooth, full-bodied lingering finish.